Hai Bro Sis...Indian bike range stretches as chewing gum and the concept, several bike variants are debut. 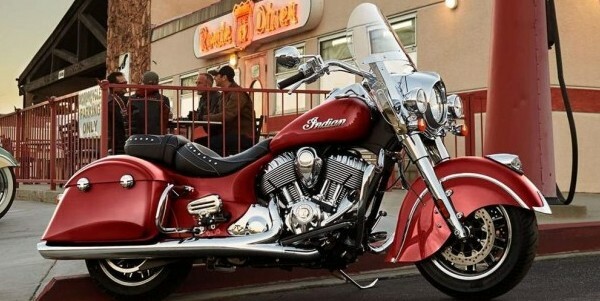 The last to arrive is the Indian Springfield, a model clearly intended to compete with Harley-Davidson Road King type bikes. All do a more functional Chief vintage. Price in Spain will be 28,450 Euros, only 300 more than that. As the rest of the Indian range has 5 year warranty. Springfield in Massachusetts was the city where the Indians were founded there in 1901. The Springfield Indians has the same inclination of 25 °, chassis and rigid suitcases Chieftain and Roadmaster, but combined with the windshield more retro and less ostentatious Chief Vintage. So it’s lighter than the first and more willing to travel to the second. Its weight is 388 pounds in running order. The versatility of the bike increases with the ability to extract the windscreen motorcycle without tools in less than a minute. Also the seat of the passenger in case of need, it can be eliminated. The list of accessories is important, with two types of available windshield, seats and heated grips or a bunch of 64 liters in the back in case if necessary. As the rest of the line is powered powered Thunder stroke 111, a modern electronic 1 811 cc fuel injection V-twin. Although its retro look may be confused, it is custom equipment very modern, with ABS (300 mm disc), cruise control or tire pressure sensor series. Headquarters is located at 660 mm above the ground and your deposit has 20.8 liters capacity, so it can be a faithful companion of travel with a retro character in her eye, as in the post-war period of the second world war in North America.